- I'll start by specifically pointing out NDPLeaderVote as an excellent resource for news as it develops. Because it's largely tracking what's happening in the media and on candidates' announcements, I won't be using these links posts to do the same to the same extent for the duration of the campaign. 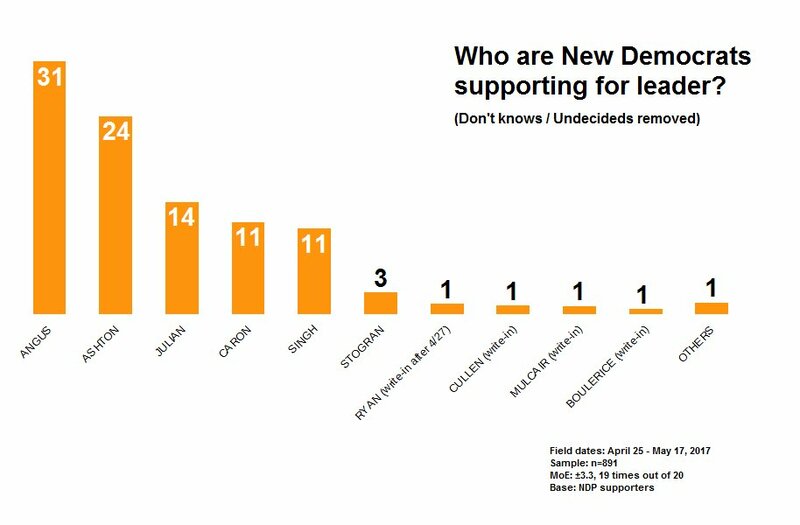 - The big news is obviously Jagmeet Singh's public announcement that he's joining the race - with a launch that included what seems to be the largest show of support for any candidate so far. And the media also seems to be paying more attention to Singh than to the other candidates on their own, with Duncan Cameron, Chantal Hebert, Martin Regg Cohn, Adam Radwanski and Evan Solomon among the prominent commentators dedicating columns to his announcement and its impact on the federal political scene. - And this despite Ashton's early-campaign propensity for drawing loud criticism for what should be absolute non-issues in the leadership race - following the previous brouhaha over quoting a Beyonce lyrics with a new complaint about her appearing in the same photo as a sign. - Finally, the NDP has slightly tweaked its debate schedule, including by adding one in Victoria in August. These factors help to explain why the digital economy has given rise to large firms that have a reduced need for labor. And, once these firms are established and dominate their chosen market, the new economy allows them to pursue anti-competitive measures that prevent actual and potential rivals from challenging their position. - But Brent Patterson notes that instead, Justin Trudeau is planning to rebrand the corporate-biased TPP as a new version of NAFTA to further entrench the power of capital. - The Star's editorial board challenges the Trudeau Libs' plans to push through a massive infrastructure bank giveaway without proper review and debate. And Stephen Whitworth examines the high price of the Saskatchewan Party's privatization of Crowns. - Diana Duong interviews Andre Picard about Canada's health care system which falls far short of the universality we expect. And Alex Hemingway comments on the devastating social impacts of the B.C. Libs' austerity toward health care and other essential services. - David Suzuki points out that increased public awareness of the realities of climate change is a necessary first step before we can make the kind of change needed to rein it in. - Finally, Laura Cameron and Joseph Wasylycia-Leis write that an impending vote in Parliament offers an ideal chance for Canadians to push their MPs to support a more fair and proportional electoral system. In 2017, America has a jobs problem: It’s not that we don’t have enough jobs, but that we don’t have enough good jobs. We all lose when pay raises for workers – despite rising productivity and quality service – are unreasoningly restrained. Corporate leaders say things like, “Our people are our most important asset.” The problem is that too few act like they believe it. And too many face Wall Street brickbats when they do. It’s time to turn down the distraction and up the voices for reasonable investment and due consideration to our workforce. If finance and investing take the right aim, the switch will be made to more good companies and good jobs. - Meanwhile, David Dayen makes the case for a public job guarantee, while pointing out how the Center for American Progress' proposal on the issue falls somewhat short of the mark. - Corey Mintz points out the problems with the Ontario Libs' workplace review in assuming that existing laws are actually being enforced. And Gary Marr reports on a new TD Bank study showing how widespread income volatility contributes to precarious lives for Canadian families. - David MacDonald asks who stands to benefit from the Libs' infrastructure bank plan, and concludes that the only real gains will go to investors taking far larger returns than would exist if governments merely borrowed infrastructure money directly. And Shawna Curtis points out the problem with necessities like housing being treated solely as profit centres rather than social goods. - Finally, Marc-Andre Gagnon discusses why universal programs which include benefits for the better-off ultimately lead to greater equality than means-tested systems. And Harold Meyerson highlights how income inequality correlates to disparate life expectancies. Here, on the importance of governments matching their talk about enforcing tax law with action - and the reason for concern that the Libs are headed in the opposite direction. - Harvey Cashore, Nicole Percy, Nicole McCormick and Patrick Butler reported here on Colin Campbell's participation in a KPMG-sponsored tax conference while chairing the committee responsible for evaluating Canada's offshore tax enforcement. And Frederic Zalac and Cashore covered Tax Court Judge Randall Bocock's recusal for attending the same conference. - Meanwhile, Cashore and Percy also note that the Libs have appointed a KPMG-connected executive as their party treasurer. - The mandate for Campbell's committee is here, while its first report (as referenced in the column) is here. - Finally, I'll again point to Percy Downe's observation that money alone won't be enough to ensure that the Canada Revenue Agency is able to collect the money owed by tax haven users. - Owen Jones discusses UK Labour's true social democratic platform as a model for progressive parties around the globe. And Simon Wren-Lewis points out that contrary to the spin of opponents and uninformed presumptions of much of the media, Labour's plan is entirely affordable. - Meanwhile, as part of the Guardian's election panel Faiza Shaheen examines how the UK Cons' platform offers pennies to workers as their reward for accepting the destruction of the social safety net. - Anjum Sultana and Nazeefah Laher highlight how a focus on the social determinants of health can lead to improvements in social and democratic conditions alike. And Nicholas Keung takes note of the health gap facing older immigrants as an area where there's obvious work to be done. - Branko Milanovic theorizes that more broadly-shared ownership of capital could ensure a more fair distribution of income. - Finally, Ijeoma Oluo writes from experience as to the devastating effects of poor-shaming.And Matthew Yglesias rightly notes that instead of pretending Donald Trump is a child, we should see his sense of entitlement and detachment from reality as natural consequences of the U.S.' coddling of the rich. Public things and the democratic space they foster and are fostered by encourage both collective responses to common problems and an opportunity to address the injustices (remainders) that emerge from even the most egalitarian and idealistic processes. The physical state of our infrastructure reflects more than a conventional repudiation of purported governmental excess. It is an attack on democracy and must be resisted by appealing to and enhancing democracy itself. - Meanwhile, Brent Patterson points out that there's ample demand for far stronger social supports, including over 91% of Canadians at least somewhat supportive of a national and universal pharmacare program. - Elizabeth McSheffrey reports on the Auditor General's findings that the Harper Cons never bothered to produce any plan to meet their promised climate change targets, while James Wilt observes that the National Energy Board lost any public trust in serving as a rubber stamp for pipelines. And Molly Scott Cato writes that climate change is one area (of many) where Trudeau has betrayed the progressive voters who wanted meaningful change, rather than continued reliance on dirty industries. - Finally, the Star's editorial board calls for Ontario to take a leadership role in establishing and enforcing labour standards and wage requirements to protect people involved in new forms of work. Paying higher fares, fees and tolls because of a political decision to use more expensive private capital would be a “massive transfer of wealth to the wealthy,” says [Guy] Caron. Now the chorus of think-tanks voicing concern includes the Canadian Centre for Policy Alternatives, Broadbent Institute, C.D. Howe Institute and the Institute of Fiscal Studies and Democracy, which is headed by former Parliamentary Budget Officer Kevin Page. The idea for the Bank followed a curious path. The Liberal-appointed advisory council which recommended a private Infrastructure Bank included executives whose investment funds stand to profit from it. That process is now subject of a conflict of interest complaint by Democracy Watch. As more Canadians see the Infrastructure Bank as an inside job to drain their wallets and enrich the rich, the sharpness of opposition attacks continues to grow. Perhaps Trudeau thought an Infrastructure Bank would hitch his star to powerful people. Maybe he’s anchored himself to a sinking sack of cement. - And Randall Bartlett asks why Trudeau is so eager to privatize profits while forcing the public to bear the risks and costs of projects. - Meanwhile, Don Braid examines how Rachel Notley's NDP is establishing desperately-needed consumer protections in areas ranging from payday lending to homebuilding - and being challenged every step of the way by businesses who had grown accustomed to being able to exploit the public. And Rachel Reeves argues that now is the time for the financial transactions tax on offer from the UK's Labour Party. - Claire Cain Miller discusses how motherhood contributes to the persistent pay gap between women and men. And Jordan Press reports on the wealth-based gap in access to child care outside Quebec, while Andrea Gordon points out how Ontario students (particularly in rural areas) are losing access to music programs due to austerity budgeting. - Finally, Ian Bremner warns against treating the defeat of a couple of far-right leaders as an indication that we can afford to accept business as usual. In recent times, there has been a lot said about those people who are “just managing”. They are neither rich nor poor, but usually working in low- to medium-income jobs, scratching a living, surviving from one month, week, day, or minute to another. A narrative has emerged of plucky, cheerful sorts who soldier on, just about making ends meet, but “can’t complain, guv”, which has the effect of rebranding a permanent grinding state of poverty as something really plucky, gutsy and wonderfully, quintessentially British. Those just managing types, what sports they are about being poor. Gawd bless ’em! Back in the real world, maybe the just managing can and do complain, but nobody wants to listen? If people are regularly reduced to borrowing just to keep a roof over their head, then they’re evidently not managing. Since when was this defined by stacking up dangerous amounts of debt just to avoid being made homeless? At what point did it become normal for people to drown in repayments just to keep up with basic utilities? It could be that a lot of these people are not remotely managing – they’re being ground down by debt in a way that’s either ignored, normalised or, increasingly, sanitised. - Mary Jordan and Kevin Sullivan write about dental care as a glaring example of the disparity in treatment based on wealth. And Rory Carroll highlights LAX's new, exclusive terminal - featuring an opportunity for the rich to entertain themselves with the comparative discomfort of everybody else. - Elizabeth McSheffrey points out how pipeline backers largely took over the Libs' much-trumpeted consultations with First Nations. Michael Geist discusses the PBO's conclusion that the Comprehensive Economic and Trade Agreement with Europe will cost Canada hundreds of millions of dollars in royalty giveaways to big pharma. And Garfield Mahood and Brian Iler suggest that it's time to name and shame the individual executives behind tobacco-related diseases and deaths - which would seem a sensible plan for any corporation which puts the public's well-being at risk to serve its own ends. - Marshall Steinbaum notes that Thomas Piketty's work in identifying and challenging inequality and economic unfairness is being papered over within the field of economics. - Finally, Alan Freeman discusses the lack of long-term preparation and planning that results in floods (and other disasters) doing far more damage than they should.